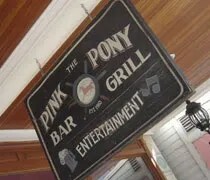 The Pink Pony Bar & Grill in downtown Mackinac Island. After our carriage tour of Mackinac Island, J and I made our way back to Main Street. It was now pushing 5:30 and we still hadn’t bought any fudge. J mentioned we should probably buy some then added she could go for dinner. I felt the same way. We burned a lot of energy today and lunch seemed so long ago. This was going to be our last meal on the Island and there were still so many choices. I picked up a Mackinac Island dining guide from the Visitor’s Center, but there were no address or maps of where any of the places were. 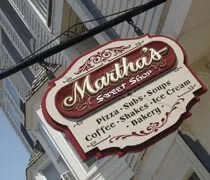 As we toured the Island, we walked by a number of places that would normally catch our attention. 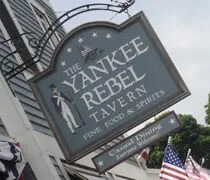 I stopped and browsed menus at a few, but when it comes down to it, J and I are really pub food people. I thought it might be nice if we could spend the end of the day enjoying dinner overlooking Lake Hudson. The first place that popped into my head was the Pink Pony. We walked by earlier in the day and it looked cute plus the back of the building overlooked the harbor. 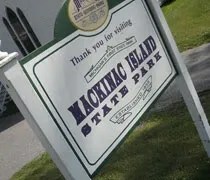 Since moving here, I’ve wanted to go to Mackinac Island. J went when she was younger. Her family did the circle tour one year and Mackinac Island was one of the stops. I’ve never been. We had plans to go for a couple days in June, but wedding plans made it impossible to take the trip. A couple weeks ago, J and I were noticing our weekends off, alone together were slowly becoming more and more rare. We looked at the calendar and figured out the last weekend in July could be the last chance until next spring for us to get away for a day, so we made plans. Our day started early. We got up around 7:30 and got on the road about 8:00. We knew we couldn’t afford to stay on the Island and we knew we couldn’t afford to take the ferry two days in a row, so we decided just to make it a day trip. Yes, it was a long day with a lot of driving, but it wasn’t as bad as I thought it would be. Mackinac Island is abouta 3 1/2 hour drive from Lansing, but it’s all four lane highway which is really nice.